More remains to be said about the relationship of music criticism to architecture criticism. Or put another way, music criticism should be considered as a kind of architecture criticism. This is not to say that the two realms have been far apart. Far from it. In fact, books like Mark Treib's Space Calculated in Seconds (1996), Robin Evans' essay "Comic Lines" from his posthumous The Projective Cast: Architecture and Its Three Geometries (1995), or even more deeply historical works such as Emily Thompson's The Soundscape of Modernity: Architectural Acoustics and the Culture of Listening in America, 1900-1933 (2002) all consider, to a certain extent, a spectrum of relationships between music and architecture. These relationships are both literal and figurative. As Treib's and Evans' work shows, the relationship between Le Corbusier, Iannis Xenakis, and Edgard Varèse went beyond physical artefacts such as the Phillips Pavilion (1958), but also extended to design methods as well. And as Thompson expertly demonstrated in her influential book, the history of architectural modernism could be understood through acoustical technologies. There is still more work to be done. Take, for instance, the role that the trip to the desert has played in the late 20th century. From Robert Venturi's, Denise Scott Brown's, and Steven Izenour's Learning From Las Vegas (1972), to Reyner Banham's Los Angeles: The Architecture of Four Ecologies (1971), to Luis Buñuel's Simon of the Desert (Simón del desierto) (1965), and even, to a certain extent, David Lean's Lawrence of Arabia (1962), the desert has become a place of reinvention and a site of reinvigoration. 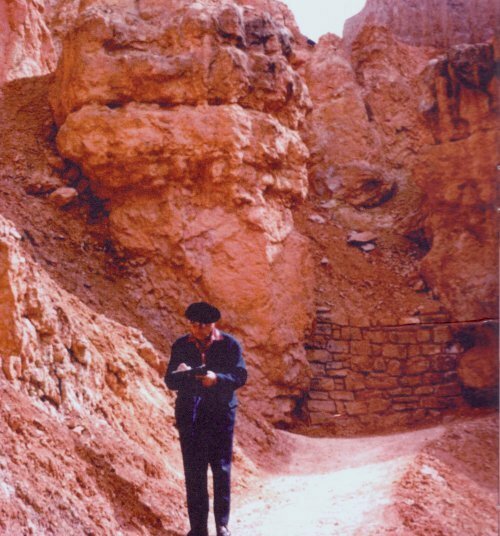 Sociologist Zygmunt Bauman has even given the desert an architectural significance of sorts. "What attracts the stranger to the city is what makes the city and desert alike," he writes. "In both, there is just the the present, united by the past, a present that may be lived as the beginning, and a secure beginning, a beginning that does not threaten to solidify into a consequence ... In the city as in the desert, the stranger, the wanderer, the nomad, the flâneur finds reprieve from time." And yet this timelessness operates on a musical register as well. Thus in his preface to The Rest is Noise (2007), critic Alex Ross describes the effect of atonal music on 20th century audiences, noting how something noisy and disorienting can be "so singularly beautiful that people gast in wonder when they hear it. Olivier Messiaen's Quartet for the End of Time, with its grandly singing lines and gently ringing chords, stops time with every performance." 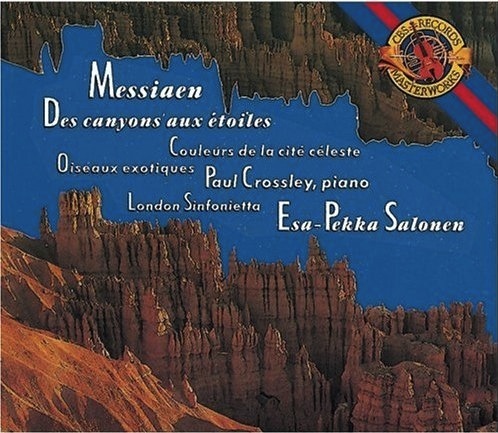 Cover to a CBS recording of Des canyons aux étoiles ... featuring an image of Bryce Canyon. His synaesthesia, like the true form of the phenomenon in any affected individual, is involuntary, the pairings of colors and sounds out of his control. What Messiaen has managed to do, however, is to find the particular sound combinations that will give rise to an extremely wide and variegated range of color responses, an accomplishment which affords him the ability to paint, as it were, in sound what is visible. It is difficult to know for sure whether this reverse aspect of Messiaen's synaesthesia—that is, visible transmuted into audible rather than the other way around—is also involuntary or simply a well-oiled habit, but the fact is that he can do it, with significant impact on his creative output. It comes as something of a surprise, therefore, to encounter a relatively intimate and genial work, employing an orchestra that is by Messiaen's standards modest … This restraint was no doubt conditioned to some extent by the dimensions of Alice Tully Hall in New York, where the work was premièred. This hall is one of the most beautiful and warmly resonant that the present writer has experiences: a fact worth bearing in mind while listening to Canyons in the dryish acoustic of the Festival Hall, where the imagination had to supply some of the inscapes of reverberation which Messiaen characteristically takes into account. The review continues with its hints of architectural and spatial orientations. Movements are "polychrome edifices." Each places "things next to another in horizontal juxtaposition." It may not be fair to impart the author with an architectural understanding of Messiaen's work, yet the connection remains useful as it points to other realms in which architecture and music collide. More analogies could thus be made of the various instrumentalities shared by architecture and music criticism. In addition to analyses of forms and structures, of shapes and compositions, there is always volume. Volume is an important concept to architectural modernism. And yet the conflation and confusion of something tangible like mass with something intangible like volume yields productive observations. A key point of reference here is Frederick Etchell's famous mistranslation of "volume" into "mass" in his 1927 version of Le Corbusier's Vers une architecture (1923). Another would be the fact that the term "volume" has another set of spatial connotations that have to do with just more than form. Erwin Panofsky famously described Renaissance perspectival techniques as the transformation of "psychophysiological space to mathematical space"—a transformation resulting in a view of space as a "quantum continuum." And later, in "Style and Medium in the Motion Pictures," he described the combination of sound, movement, and image in film as both a "dynamization of space" and a "spatialization of time." When combined, these two observations lead to an idea of space as something defined by the presence and movement of light and matter. In other words, it is a framework that could be understood as a way for sound to create and define space. Sound emantes from a source, and waves shape and define the space and objects in the same way that radar or sonar use wave phenomena to "paint" a picture. Volume, in its musical sense, can refer to either the quality of a sound or to its combined strength, power and mass. And yet volume is not only a way of describing three dimensions, but it is also a way of describing how sound travels in three dimensions. 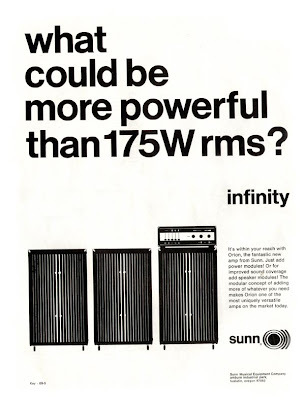 Consider, for a moment, the sonic call-to-arms "MAXIMUM VOLUME YIELDS MAXIMUM RESULTS." It is an equation of sorts, a seemingly pithy grouping of words featured on all of Sunn O)))'s albums. Comprised of Stephen O'Malley and Greg Anderson, this Los Angeles-based outfit specializes in a blend of low-frequency bass and guitar feedback drone combined with a sometimes-baroque sensibility—it almost goes without saying, but this is some very loud music. 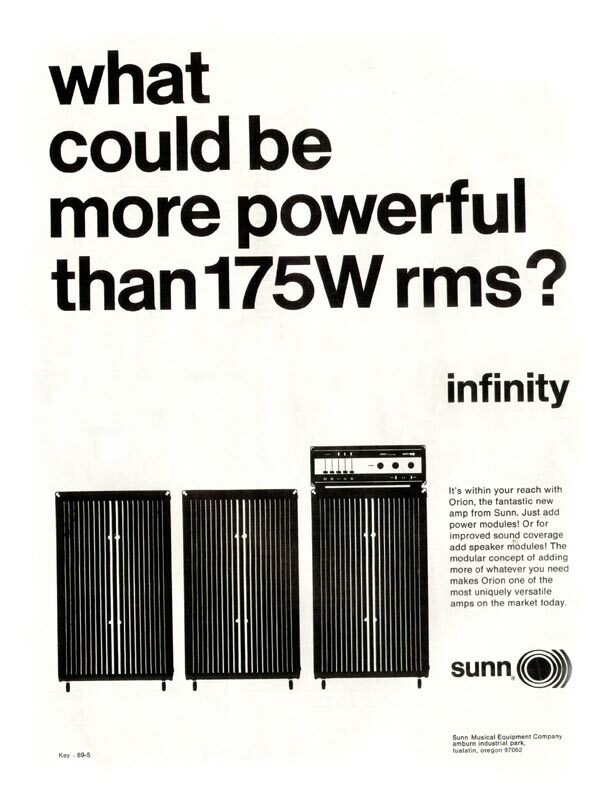 Volume is a product of the band's massive array of Sunn and Ampeg amplifiers and cabinets. 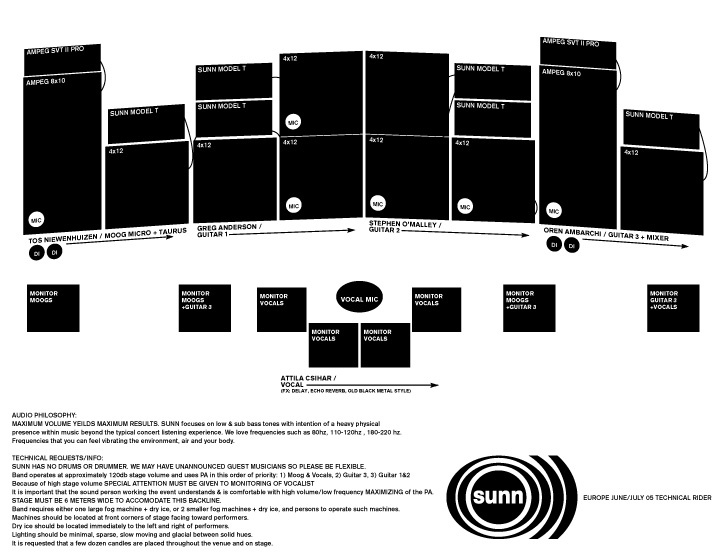 The band's logo, which references Sunn's own logo, shows an eye-like "O" emanating unidirectional waves. 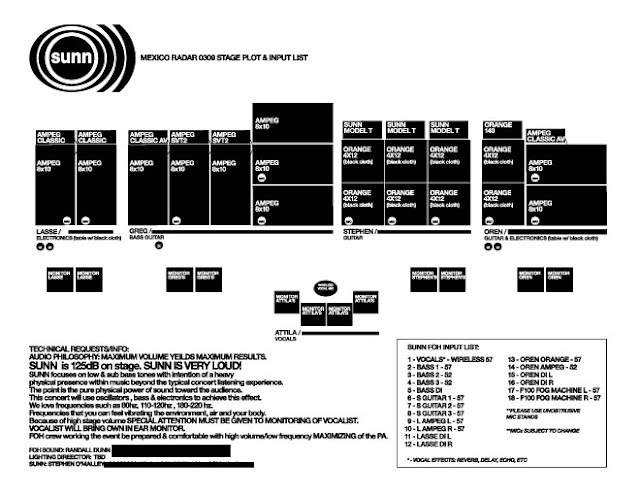 And yet a 2005 schematic published for the band's European tour hints at another dimension of architectural-ness. Note the placement of the various cabinets and amplifiers. 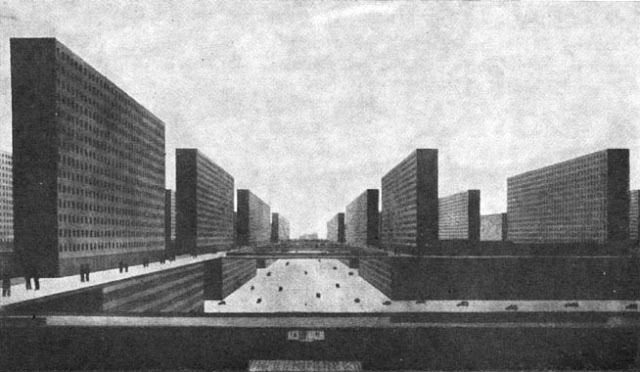 Here is something of a sonic equivalent to Ludwig Hilberseimer's Hochhausstadt (1924), obsidian-like rectangular forms distributed across an empty, isotropic expanse. Or, squint your eyes a little bit, and there is a passing resemblance to Le Corbusier's drawing of Buenos Aires from the River Plate, an negative image where fields and black and white are confused for one another. Zygmunt Bauman, "Desert Solitaire" in Keith Tester, The Flâneur (London: Routledge, 1994), p. 140. Alex Ross, The Rest is Noise: Listening to the Twentieth Century (New York: Picador, 2007), xvi. Jonathan W. Bernard, "Messiaen's Synaesthesia: The Correspondence between Color and Sound Structure in His Music" Music Perception: An Interdisciplinary Journal, Vol. 4, No. 1 (Fall, 1986), p. 44. Oliver Knussen, Review: Messiaen's 'Des Canyons aux Etoiles...' Tempo, New Series, No. 116 (Mar., 1976), p. 39. For more on the mistranslation of Le Corbusier's Vers une architecture, see Jean-Louis Cohen's introduction to Toward an Architecture, John Goodman, trans. (Los Angeles: Getty Research Institute Publications, 2007), pp. 1-82. Erwin Panofsky, Perspective as Symbolic Form, Christopher Wood, trans. (New York: Zone Books, 1997), p. 31. Panofsky, "Style and Medium in the Motion Pictures," in Irving Lavin ed. Three Essays on Style (Cambridge, Massachusetts: MIT Press, 1997), p. 96. Making music out of space and place through the alchemy of synaesthesia is a thrilling idea - but I wonder if there hasn't been musical use of spatial measuring methods, like sonar, that don't require the leap of belief & imagination that the synaesthetic method does? Can't think of any examples immediately, but it would seem pretty plausible that there were some projects made with these methods out there.